Think you can make a prettier diamond ring than Tiffany? A tastier chocolate bar than Hershey’s? A more stylish dress shirt than Kenneth Cole? So do a number of retailers that have recently launched to meet the growing demand for personalized products. These e-commerce businesses, known as mass customization companies, are putting consumers in the designer’s seat. They let you choose the softness of your mattress, select the toppings for your candy confections, and pick how many rubies to encrust in your jewelry. And these merchants are betting this holiday season that they can compete with more traditional gifts sold in stores by giving consumers the freedom to make perfect presents. Custom jewelry site Gemvara, tailored shirt business Blank Label, chocolatier Chocri, and Create-a-Mattress (no explanation needed) are among the mass customization businesses rolling out aggressive deals and discounts to lure wannabe designers. The companies hope giving consumers a choice will also make them feel better about spending money — especially at a time when merchants have scaled back on creativity because of their own recession struggles. This week, Create-a-Mattress is promoting its “Give the Gift of Sleep’’ deal, which takes 10 percent off mattresses. The Needham company, which was founded in May, allows consumers to choose the materials, softness, dimensions, and features — isolation coils or memory foam, for example. 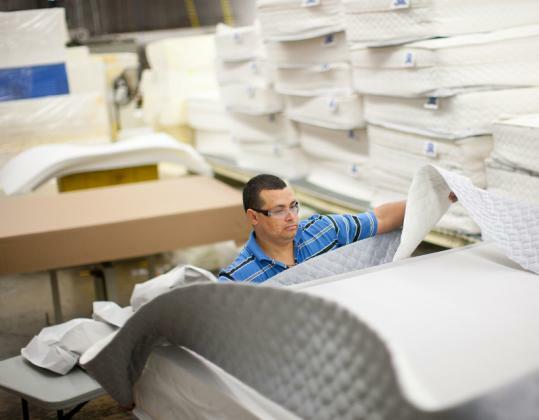 The made-to-order mattresses are manufactured in the Boston area and range from $369 for a basic twin to $6,718 for a king-size set with power adjustable base. Lexington-based Gemvara is also hoping to attract holiday shoppers looking to add a little bling to their lives (or the lives of loved ones). The jewelry site, which launched in February, offers consumers more than 1,500 original designs and a choice of 26 gemstones and eight precious metals to create custom pieces. After consumers place the orders online, a jewelry designer will look at the computer aided design and then create a mold, pour the metal in, and set in the selected gemstones. The finished piece is shipped within two to three weeks. Gemvara, which has a design studio in Downtown Crossing, is featuring a number of promotions after Thanksgiving, including $20 off orders under $250, $100 off orders over $500, and 10 percent off all black diamond jewelry. Items start at $50, and the average order is about $1,000. Matt Lauzon, Gemvara’s founder, said the company expects holiday sales this year to make up more than 50 percent of Gemvara’s annual sales. “As people are becoming savvier about how they spend their money, we are seeing more people choose jewelry from our site because they want to make sure their gifts have a personal element to them and create extra meaning between the gift giver and the recipient,’’ Lauzon said. FashionPlaytes is a Salem start-up that lets girls create an entire wardrobe for themselves — and even matching dresses for their dolls — at prices typically ranging from $25 to $50. The company expects to sell more than 4,000 gift cards compared with just 1,000 last year. Chocolatier Chocri is also banking on holiday sales to boost the business. The company is hoping to lure early bird shoppers with a 10 percent discount this week (an average chocolate bar costs about $7). And Chocri is lining up other daily deals throughout the season, such as expedited shipping and free toppings like holiday bears and mini Christmas cookies. Chocri has become the gift destination of choice for Liz Sachs of Somerville. Sachs has designed bars with chili peppers and spices for Valentine’s Day for her husband; chocolate confections with gummy bears and a birthday banner for her brother; and a tasty bar with hazelnut, toffee, and sea salt for herself. Custom T-shirt company Spreadshirt, with US headquarters in Boston, is hoping to find shoppers like Sachs who create gifts for friends and families — and themselves. In addition to providing free shipping, Spreadshirt this week is offering freebies when consumers purchase multiple items. Shirts start at $9.90 and increase in price depending on brand, style, and graphics, such as “I heart’’ designs. “Through promotions like the ‘Buy 5 items, Pay for 4’ we help encourage our customers to think not only about personalized gift giving, but ordering something for themselves, guilt-free, during the holiday season,’’ said Philip Rooke, a Spreadshirt spokesman.